The TARDIS arrives in the CAGE – not a trap, but the College of Advanced Galactic Education, one of the most prestigious academic institutions in colonised space. Not a trap. Or is it? The answer is, obviously, yes. In fact the Doctor recognises her handiwork straightaway, although he doesn’t tell Peri, who has to wait until the end of episode one for the music to kick in. With that accomplished, the rest of the story shrugs off any pretence of mystery and gets on with the Doctor and the Rani slugging it out just as they did on the tellybox back in the 80s. There are differences this time around: not least of which is that the unfortunate passing of Kate O’Mara has meant reincarnation and recasting for the Rani. It’s done impeccably, and never once does the listener feel uncomfortable with Siobhan Redmond’s portrayal – a modern take on an under-utilised character, and one that is very much appreciated. Again, it’s a reminder that Sixey’s era – both TV and audio – has massive variety and depth, both in companions and in villains. I wish the story itself had lived up to the encounter, though. This trilogy has been unable to live up to the incredible start that The Widow’s Assassin provided (which you can sort of understand given that Nev Fountain must have a direct line to Cthulu’s plot factory in his basement! ), and so we end up with the Rani and the Doctor trading epithets in a medlab in a story that would have fitted perfectly into the TV run. Outside this trilogy, perhaps it would even be a superior Six tale, but at the moment it just lacks that certain ooomph. Sidelian brain scanners and the vague concept of reverse-engineering chaos theory merely serve as the backing track for a Timelord tiff. It doesn’t help that Peri spends a large part of the story either in peril (again) or actually outside her own body (again). 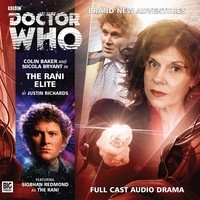 Fair enough to carry on her story post-Mindwarp, but in some respects this is the Peri of the TV series, rather than the more expanded and nuanced Peri we’ve come to expect from Big Finish. And just as Peri has regressed, so has the Doctor – brash, blustery and apt to insult his companion as much as the villains. By the time the sliding walls and floors of the modular medlab tipped the Rani into a pool of sludge to await the authorities – and the modular malarkey was a neat idea, even if the sound effects of the rising water just confused the issue until I relistened to it all – I was remembering …ish and thinking that despite the Rani’s presence, I much preferred that as a campus-based Six/Peri adventure. Hey, you can’t win them all.